A house in France with an indoor swimming pool is something many people dream of. Even in France the weather isn't always hot enough to swim outdoors. So most outdoor pools, unless heated, are only used from late May to the end of September. An indoor pool in France is a real touch of luxury. 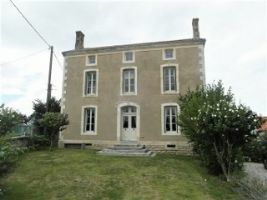 The prices may surprise you as the past few years have seen many sellers reduce their prices in France. So this year, even luxury properties in France are more affordable. 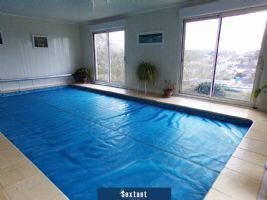 If you want to rent out your French property to holidaymakers when not using it yourself, an indoor pool makes it a very desirable proposition. Owners of rental property with indoor pools in France rent their homes out throughout the year (Letting property in France). Your income increases as does your chance of enjoying some summer time at the property yourself. Indoor pools - what type is best? Indoor pools in France, like outdoor pools, come in many shapes and sizes. Some, designed for exercise and fitness, have a current which can be switched on to create resistance for the swimmer. Other indoor pools in France are designed to enhance the character of the house with exposed beams. It depends on the property and the reason that you want an indoor pool. 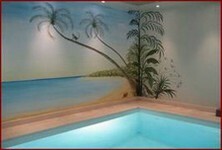 Indoor pools in France are even more luxurious when they come with saunas or jacuzzis. See our properties below that have such facilities. The health benefits of having an indoor pool in France are a great bonus. All year round swimming keeps you fitter. It provides aerobic exercise, works muscles safely without putting pressure on joints and is useable by people suffering from disabilities as well. 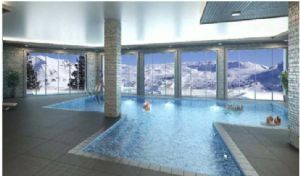 An indoor pool is also a great way to relax after strenuous exercise such as skiing (Ski property). So if you can have an apartment in the Alps with access to an indoor pool, so much the better. Ten French properties with indoor pools follow below, so take your pick! Reduced for the 2nd time in a year, this is a first-class, spacious, elegant family home built in 1878, the house totally renovated–rewired, replumbed, new roofs– finished to a very high standard. 2 generous reception rooms, 4 large bedrooms & 3 bathrooms. 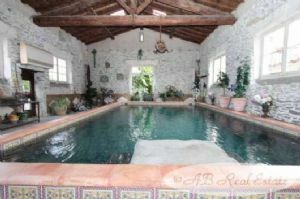 Across a courtyard from the house, the fully restored carriage house has a heated indoor pool & mezzanine with office. Outside, a deck and covered seating area. 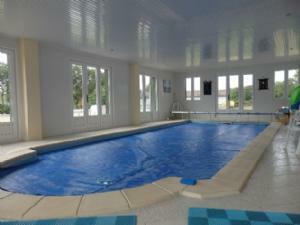 In Loué, this is a detached house with indoor swimming pool, walled and with gate, on a 1200 m² site. On the ground floor, there is a garage, a kitchen, a 51m² living room, a dining room, a bedroom, a toilet and a separate bathroom. On are 3 bedrooms, one with wash room, and an additional separate wash room. Heating, water heater and pool heating are connected to town gas supply. 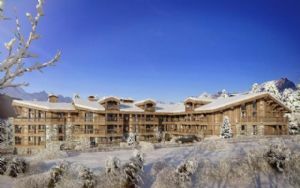 STUNNING 2 to 6 bedroom new LUXURY ski apartments for sale in 5* prestigious new residence in fantastic central location in Les Gets ski resort, close to all amenities. INDOOR POOL and SPA . Restaurant, bar & Concierge on site. Only 150 metres from ski lifts. Refined high specification interiors combining Alpine and contemporary design. Private ski lockers & underground parking. A unique opportunity for lifestyle and investment. 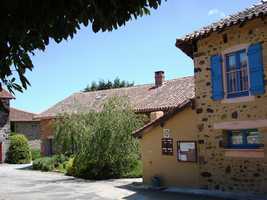 New apartments in beautiful 4* residences within Les Menuires. 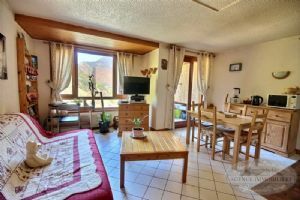 Set in a superb ski-in ski-out location close to many amenities, the residences have great views over the Belleville valley. Luxury onsite facilities include: Sauna, hammam, indoor heated swimming pool, children’s nursery, and on-site spa. Les Menuires is one of the two major resorts in the third valley’, located at 1850m altitude on the western slopes of the Belleville valley. 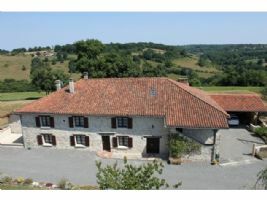 This former farm house has been extensively renovated to give a prestige family home in the heart of the Limousin countryside. It was an absolute pleasure to view this property; quite simply breathtaking! The possibilities for this beautiful home are endless, it could easily be run as a B&B or even a Health/Spa Retreat if not required as a home. 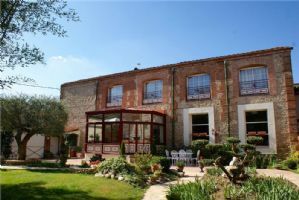 Just exceptional, this former wine storehouse has been converted and entirely renovated with the highest quality of specifications, into a superb property of more than 400m² total living space with a garden mature of 650m². The ground floor comprises a veranda dining area, a kitchen, a gym room, a shower room and an indoor heated pool. The 1st floor offers a 85m² living dining area with high ceiling and its open plan kitchen, 3 vast bedrooms and 2 bathroom.